I have attempted to resolve micro stuttering in games, and some applications, for over a year since building this system. It has been occurring since day 0. I have attempted fresh Windows 10 (varying builds) and Linux Mint installations over several disks (mostly SSD's, but also HDD's), and do this every time I have replaced/upgraded a component in an attempt to resolve the issue. I have changed every component at least four times, and in some cases more. I have tried 3 x Nvidia 1060 3GB, 1 x Nvidia 1060 6B, and an AMD RX 580 8GB. Each time I have added/replaced/upgraded a component, I have initially tried it on the original Windows 10 install, also the original Linux Mint install, and then on new SSD's installing each (you can see how much money this has cost me to try and resolve this). I have sufficient PSU Corsair RMx 650W, and have tried the Corsair RMx 550w, and 2 different Corsair TX 550w. I have tried all the varying XMP profiles, and stock speeds, adjusted speeds, increased and decreased latencies for the RAM. I have tried 4 x ASRock AB350m Pro4, and 1 x Gigabyte DS3-H, with all the different BIOS available. I have tried underclocking, overclocking, chipset drivers, etc. I have updated SSD firmware. I have tried Microsoft, and AMD drivers for components and peripherals. I have tried different peripherals. I have tried with and without monitor software. 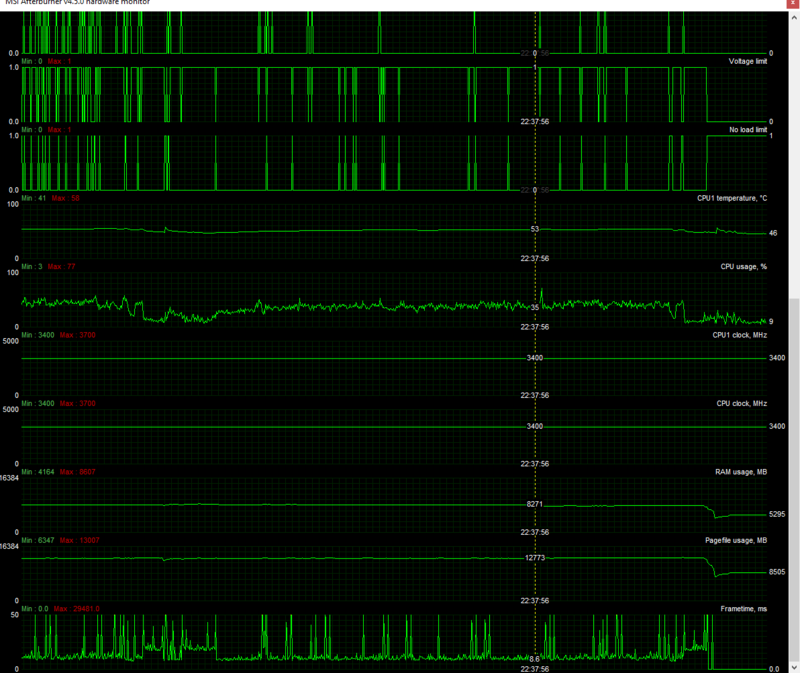 You can clearly see the frametime spikes here that correspond to a 'stutter', sometimes freezing for up to 500ms, sometimes, less. It is very unpredictable. I am thinking of buying a different Ryzen series (Maybe Ryzen 7) and I have just purchased ANOTHER motherboard, the ASUS B450M-A. Have you replaced SATA wires? Could you have a motherboard standoff in the wrong place? These are the only things I could think of. What games are you getting these spikes in? I get the spikes in all games, sadly. What games specifically, and what FPS are you seeing? I have tried different outlets, different power strips, and different physical cabling. Sadly there was no suggestion to think there would be an issue there. Have you tried the PC at a different place? Maybe there is an issue with the power in you house as a whole. I know it does not seem likely, but if you have changed every other part you are down to what is always the same. CS:GO, League of Legends, Overwatch, Final Fantasy XIV, but on every other game I have played, too. I don't have that luxury, unfortunately. Sadly, it is not possible. I did try and use this and everything was fine. Though, I don't know if this was a suitable piece of test equipment. The strange thing is, somebody else (many) in the thread I originally posted have claimed the same thing, and said that when they have had friends come over to bring their machine (Intel) it has not happened. Of course that isn't certain to prove it's Ryzen issue, the consistent thing is Ryzen 5 x600 models that are causing it. The FPS are typically in the 250-400fps range. I tried locking it at 144/145/150 and still experienced it. Please see this video and if you slow it down, you can see the net_graph at the bottom right when it stutters. You notice the stutter is quite bad even in real time. I take it the stuttering happens when you are not playing online as well? What frame rates are you trying to push? I noticed in your build that you have 144 hz panels, are you trying to maintain that high of FPS? Oh, and a couple more random thoughts. Have you tried just one monitor plugged in? Have you tried disabling the sound on games, or turning the sound settings in the OS down to 16 bit over 32 bit? Again I know it sounds strange, but years ago I had an issue playing Medieval Total War, and figured out it was the sound causing the game basically not to run. It maintains that level of FPS fairly easily, yes. Only when the stutters occur does it partially drop for a brief period (i.e. the stutter itself). It does happen when not playing online, too, however it is far more prominent when playing online. "Sorry we have not been able to reproduce the stutters. The logs you provided shows stutters from blocking pixel shader compiles, from blocking resource creates, the main app thread going long on some unknown operation. This type of stutter in theory is not caused by the GPU so likely if you were to swap out the GPU, you would still see the issue. I don't think whatever the cause is, that it is an NVIDIA issue." They were entirely correct, I purchased an RX580 8GB and it persisted. I have tried 4 different Ryzen 5 1600's. I have tried constant clock, constant voltage, stock operation (core performance boost, etc), under clocking, power plans in Windows, etc. I have also tried disabling SMT, but it made little difference. I am currently using a PState overclock, which seems to give the best of both worlds, alas, I have tried all of the above and nothing resolves the issue. what about processor and chipset drivers? Of course, as stated in the post, and the original AMD thread that I created, I have added these. what about the memory? you might have a "bad" mem, try running with one stick, run fire strike replace it with the other one and do same thing. I have tried several sticks and pairs. Corsair and G Skill. Individually and as a pair. I have run tests, too. The memory is good. That could be as simple as your net connection to the game server it can't process information it's not receiving fast enough to keep everything fluid. Would that cause a local system stutter? The machine freezes for a brief period and causes a high frame time, and forces the FPS to drop momentarily. I am not so sure, but I wont rule it out. Also worth mentioning, the GPU voltage fluctuates, and clocks flutuate around the same time. It happened with each GPU I tried. But it doesn't always stutter when this happens. Oh, one other thought. Have you tried a different outlet in your home, or taken it to a friends house and try it? I have replaced SATA cables, too. I have also tried with different disks physically connected/disconnected. The way the case is designed, there isn't so much a requirement to use standoffs, because they are built in. It's the Thermaltake Core V21. Also worth mentioning that I have built outside the case, and it does indeed still happen. Did you thought to try it with an UPS unit? At least to ensure you have a constant power current, and discard that. Assuming you didnt try in another home. I would use another monitor (none of those 2) and try it. I thought I've seen it all. Guess not. I haven't tried with UPS unit yet! But this will be my last resort.